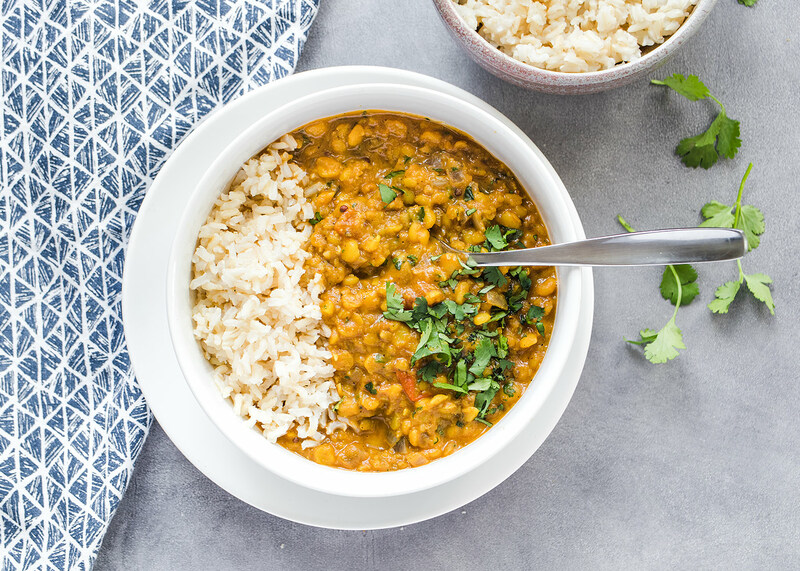 Dal is one of our favorite Indian meals to make. It’s quick, easy to customize depending on your spices on hand and taste preferences, and is full of flavor. We experiment watching different Indian recipes on youtube, take Indian cooking classes on SkillShare and peruse through our Indian cookbooks quite a bit to learn how to cook Indian food. Dal is a type of lentil or legume, such as red lentils, split chickpeas, etc. In India, dal refers to both the legume and a dish. They are packed with nutrients and keep us full for a long time. 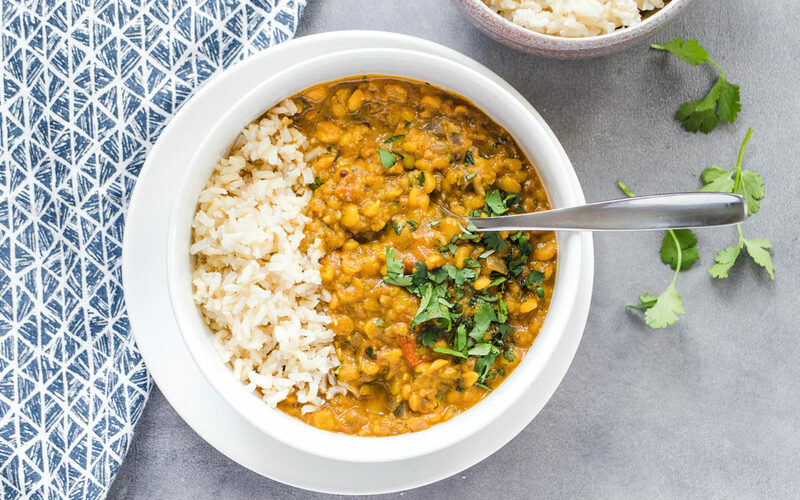 This dal uses yellow split peas specifically, although there are other types of dal you can use. Feel free to experiment with adding curry leaves with the cumin seeds, coriander powder or even fenugreek leaves with the cumin powder if you have them. We also just started experimenting with amchur, or mango, powder as the citrus for our Indian meals instead of lemon/ lime. Build up to these items, but know they are available and fun to play with. Soak the split peas for an hour before (if you have time) and then rinse and drain the water. Rinse them no matter what. Add the split peas, salt, turmeric and 2 cups of water to a medium saucepan (lentils should be covered by about 2 inches of water). Bring to a boil, then simmer with lid tipped until the lentils are soft (almost mushy) and most but not all of the water is gone. While the split peas are cooking, begin prepping your vegetables. Finely chop the red onion, chili's and cilantro leaves. Mince the garlic and ginger. Chop the tomato. Set aside. Once your split peasare almost cooked, it's time to make the spice mixture. Heat a wok or large skillet on medium. Once hot, add 2 teaspoons of vegetable oil. Then add the cumin seeds and curry leaves (optional). Let cook for about 10-20 seconds, until cumin seeds are crackling. Add the onion and cook well until the onion is starting to caramelize/ brown a bit. Then add the ginger, garlic and chilis and cook for 1 minute. Add the chopped tomato and 1/2 teaspoon of salt to the wok. If you need more oil, add a bit more. Stir well and cook until the tomato is cooked down, about 10 minutes. Then, add the chili powder, cumin powder, coriander powder (if using), salt and stir well with the tomato mixture. The split peas should be done at this point and you're ready to add them to the tadka/ tomato mixture. You want about 1/2 - 1 cup of water with the split peas when you add them to the tadka . If there's too much water in the lentils, drain them a bit. If you need more, add it to the skillet with the lentils. It all depends on how soupy or thick you want the dal. Add in the garam masala and coriander (optional). Stir the mixture well and let it cook a few minutes. Squeeze some lime or sprinkle some amchur (mango) powder for citrus on top and it's ready to serve. Eat with rice or naan (or sourdough bread like we did because we had it on hand).